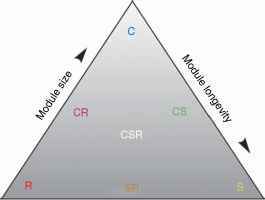 Cellular automata are discrete-space and discrete-time models commonly used in ecological modeling. They represent a radical alternative to conventional resource competition models in that system properties emerge from a bottom-up, self-assembling approach that specifies local rules of resource processing and plant development. R. L. Colasanti, R. Hunt, and A. P. Askew have explored the ecological properties of a self-assembling, cellular automaton model by simulating the competitive interactions between distinct plant functional types. The model is a two-dimensional section, showing the plant in its above- and belowground environments. The whole plant is represented by a branching structure made up from standard 'modules'. The behavior of each plant is determined exclusively by a set of rules that act only at the level of the individual module and include an explicit representation of root and shoot processing of resources. Based on J. P. Grime's C-S-R system (assuming an evolutionary tradeoff between competitive ability, stress tolerance, and resistance to disturbance), the seven plant functional types differ according to three fundamental traits: size of plant modules, longevity of modules in the absence of resources, and propensity to flowering (Figure 7). At the level of the whole plant, the model displays a classical S-shaped growth curve, plasticity in root-shoot allocation, and root foraging in patchy soils. At the level of the plant population, it reproduces the -3/2 thinning law. Figure 7 Combination of plant traits used to reproduce seven C-S-R functional types within the self-assembling model. the extent of demonstrating smooth, competitive replacements along gradients of resource or/and disturbance. 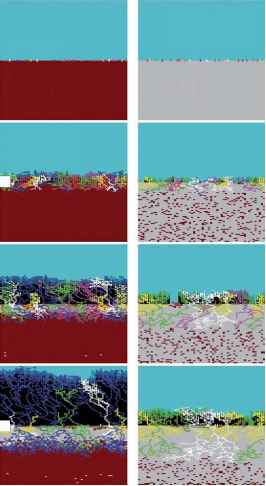 Figure 8 Snapshots of two sequences of colonization by virtual self-assembling plant communities, starting from seedlings of an equal mixture of seven functional types (time 0). To the left (a), plants colonize a nutrient-rich soil (brown cells), whereas to the right (b), they colonize a nutrient-poor environment (gray cells). As young plant grow, roots consume nutrients and create depletion zones in the soil, while shoots intercept light and create shade beneath their canopy (black cells). In case (a), shoot growth is high and leads to an intense asymmetric aboveground competition for light. In case (b), nutrients being limiting, symmetric resource competition stimulates root growth and leads to spatial partitioning of the belowground biomass. At the end of the simulations (time 3), type C (blue) dominates all other types in a rich environment, whereas stress-tolerators of type S (yellow), CS (green), and CSR (white) have outcompeted all other strategists in a poor environment. Fugitive ruderal species of type R (red) can only establish and shortly survive in gaps, as illustrated at time 2 in the second sequence. Image reproduced from a presentation of Rod Hunt, available at http://www.people.ex.ac.uk/rh203/ presentations.html, with permission of the author. colonizing a nutrient-rich soil or in a nutrient-poor soil, without any disturbance. As in natural communities, the outcome of the competition is quite different for the two cases: in a rich environment, competition for light becomes intense and the C-strategist outcompetes all other types; in contrast, stress-tolerators S, CS, and CSR are favored in a poor environment. 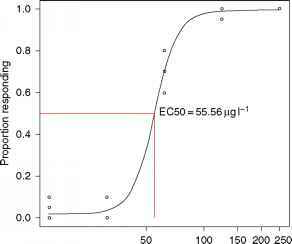 This model confirms that the dynamics of herbaceous plant communities can be emergent from the resource-handling properties of the organs of the constituent species, and that a simple rule base can, to a first approximation, be sufficient to reproduce such dynamics.